Medalist Lucy Li, 15, of Redwood Shores, Calif., survived a marathon day of golf on Thursday at Poppy Hills Golf Course, winning three matches covering a total of 43 holes to advance to the Quarterfinals of the weather-delayed 70th U.S. Girls’ Junior Championship. For the third consecutive day, fog delayed the start of play, which has created havoc with the schedule and forced competitors into longer-than-normal days. Li was one of four competitors to complete her Round-of-16 match before play was suspended for the day due to darkness shortly after 8 p.m. PDT. The Round of 16 will resume on Friday at 7 a.m. – weather permitting – followed by the scheduled Quarterfinal and Semifinal matches. The 36-hole championship match is set for Saturday. So far this week, fog has caused delays totaling 9¼ hours. Li, No. 10 in the latest Women’s World Amateur Golf Ranking™ (WAGR), had her Round-of-64 match suspended after nine holes on Wednesday night due to fog and darkness, and then needed to hole a birdie putt on the par-5 18th to outlast No. 64 seed Cory Lopez, of Mexico, 1 up. She then rallied from an early deficit to defeat Jing Wen Lu, 18, of the People’s Republic of China, 3 and 2, before grinding out a 1-up victory over Amari Avery, 14, of Riverside, Calif.
Against Avery, Li built as much as a 4-up lead through eight holes before the Southern Californian began to peck away at the deficit. Avery, who played 42 holes on Thursday, had a chance to force extra holes for a third consecutive match, but missed an uphill 20-footer for birdie on the 18th green. Li then stepped up and converted her short par putt to earn her first trip to the Quarterfinals in four U.S. Girls’ Junior appearances. Li, who helped the USA reclaim the Curtis Cup last month at Quaker Ridge Golf Club, will face Doey Choi, 18, of Australia after Choi dispatched 2016 Girls’ Junior semifinalist Yujeong Son, 17, of the Republic of Korea, 2 and 1. The key moment came on the 15th green where Choi, competing in her first U.S. Girls’ Junior, made a birdie to go 2 up with three to play. Two ensuing pars closed out the match. Choi is bidding to become the second Australian to win this championship – Minjee Lee won in 2012. Choi’s fellow Aussie, Stephanie Kyriacou, wasn’t so fortunate, as Alexa Pano, 13, of Lake Worth, Fla., earned a hard-fought 1-up victory in the Round of 16. The youngest remaining competitor stuffed a knockdown pitching wedge on the 118-yard, par-3 17th hole to 6 feet for a winning birdie. Kyriacou had one last chance to force extra holes on No. 18, but missed a 12-footer from below the hole. No. 2 seed Yealimi Noh, 16, of Concord, Calif., also finished her Round-of-16 match before darkness, eliminating 2017 semifinalist Taylor Roberts, 16, of Parkland, Fla., 3 and 2. Defending champion Erica Shepherd, 17, of Greenwood, Ind., was eliminated in the Round of 32 by incoming Michigan State University freshman Valery Plata, 17, of Colombia, 3 and 2. 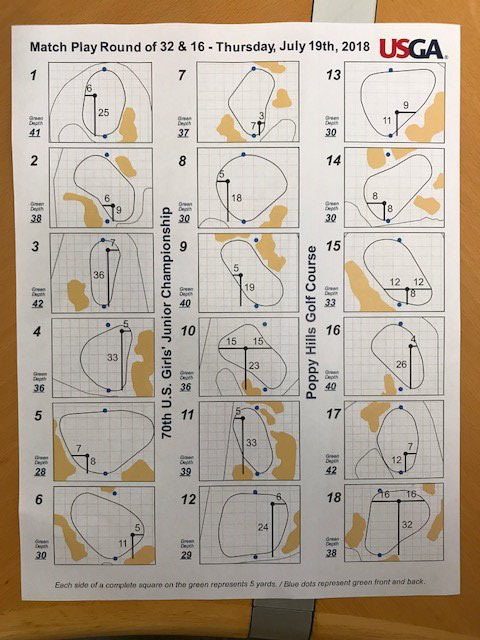 All quarterfinalists are exempt into the 71st Girls’ Junior Championship, July 22-27 at SentryWorld in Stevens Point, Wis., provided they have not reached their 19th birthday by July 27 and remain an amateur. Lucy Li and Yealimi Noh could become the first Nos. 1 and 2 seeds to play in the championship match of the U.S. Girls’ Junior since 1964 when medalist Peggy Conley defeated Laura MacIver, 6 and 5.